Many in agriculture know someone whose life has been affected by a farm-related injury or death. The statistics are sobering. Even more tragic is that these incidents could have been prevented with a few simple safety precautions. That's why the Progressive Agriculture Foundation® is on a crusade to bring safety and health information to the farming communities who desperately need it. At the heart of this effort is the Progressive Agriculture Safety Day® program. This educational program provides training and resources for local communities to conduct one-day safety and health programs. Safety Days are designed to be age-appropriate, hands-on, fun, and safe for children. Progressive Agriculture Safety Days are conducted in the United States, Canada and the U.S. Territories. In addition, the program is licensed in Argentina, Brazil and Uruguay. For the most up-to-date program numbers and statistics, click here. 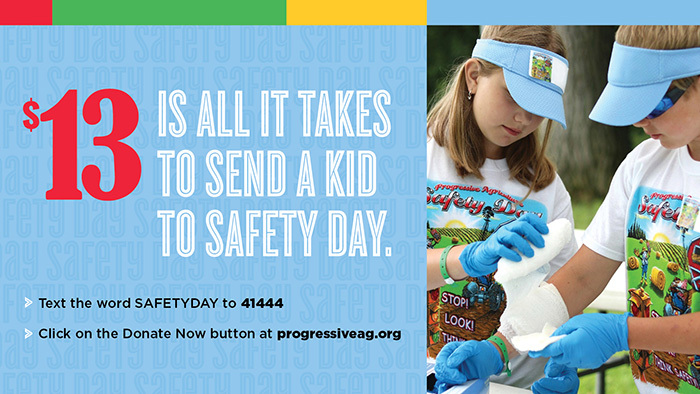 The mission of the Progressive Agriculture Safety Days is simple – to provide education, training and resources to make farm, ranch and rural life safer and healthier for children and their communities. Take a look at our Success Stories to hear what others are saying about the Progressive Agriculture Safety Day® program. Find out from coordinators, volunteers, parents and participants what unsafe behaviors have been changed and the safety practices that have been implemented since attending a Safety Day.